This Thursday, August 29th we'll start a new live stream of the game. This time - about Bf-109 F-4. The hosts of the event will be Albert 'LOFT' Zhiltcov and Andrey 'Zak' Shumakov. Live-stream starts in 16:00 GMT. And of course, the recording will be published with English subtitles on our YouTube channel this Friday. In developer's blog #29 we are sharing with you this pack of brand new in-game screenshots showing Pe-2. Peshka will be the key Soviet bomber in the game, and many pilots have been in anticipation of the first news about the aircraft. The recently opened MEDIA section of the official site offers 8 new screenshots with Peshka in high resolution and all other previously published gameplay pictures as well. And if you want to go to the Dev blog now, please, click HERE. Dev blog got updated with the latest live stream record. We prepared and published it specifically for you to be able to watch it again, and this time - with English subtitles. Note, that other European languages may be added as well later. Read the developer diary on the forum. This Friday brings an important update to the game's official website. Welcome to the newly opened ABOUT section. What are game's features? Who is developing this sim? We're glad to answer these and other question in that new part of the site. Get to know IL-2: BOS better reading the ABOUT section. 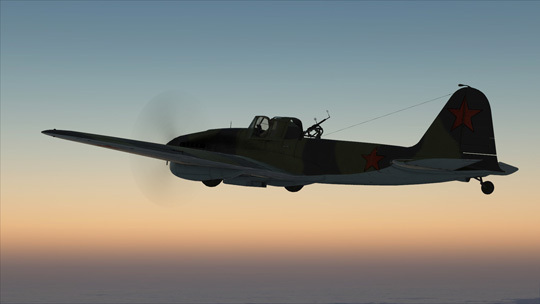 Today, in 16:00 GMT we'll start a live stream of IL-2:BOS. The hosts are Albert "Loft" Zhiltsov and Andrey "Zak" Shumakov. You have a chance to see realtime gameplay streaming, hear developers' comments and of course talk to your friends in the chat. The traditional Friday dev blog update features answers of the Chief Producer to the most frequently asked and interesting questions of the community, and a pack of fresh screeshots showing IL-2. Also minimal system requirement have been revealed in this diary.